Are you set on going through New York? Most scenic route will be on Western New England Greenway. From NYC, take Metro North train to Norwalk, CT. Bicycle permit is $5.00. Take RT2. It should not be bad off season with very wide shoulders. Call Local Motion for other ideas. Thanks for the input John! We have some flexibility regarding timing, but we are looking at about 1 month in length. We're all committed to putting on the miles this summer. We live a few blocks from a 3 mile bike path that ends at a federal campground. So that will work for some shakedown overnighters. We also have a paved, rural 20 mile loop one direction, and a 65 miler the other way. Not sure if we'll look for a loop or a point to point. How long do you have for this trip? A week, a month, a season? I suspect that with the kids and a non-cycling wife, you'll want to keep the daily distances short, maybe about 20 miles. With short distances, you'll want to look for an area with lots of closely-spaced services, and some interesting things to keep the kids entertained. And you might want to stay away from the really big hills. A loop course has the simplest logistics, but maybe you're thinking of a point-to-point? Thanks for sharing that! I enjoyed the video. Hello everyone! I just found this website and forum, and signed up right away. I hope to make some friends and learn lots of cool stuff here! Short story... 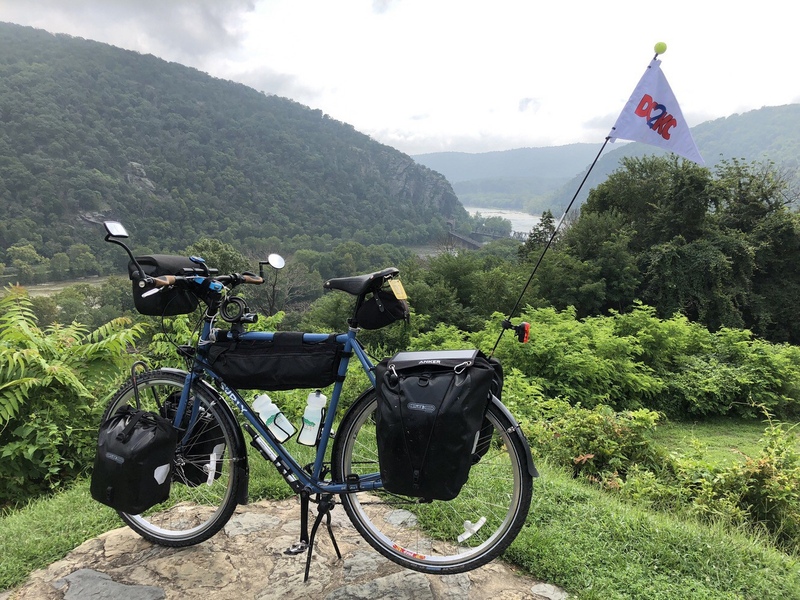 I'm planning my first family bike tour for this fall 2019. Longer story... It's me, my wife, and 2 kids. Ages 48, 38, 8, and 3. I've biked my whole life, until recently. I just bought a new Jamis steel road bike to get back into it. Prior to that, well I've biked constantly, daily year-round commuting, and a couple extended car-free stints, until about 5 years ago. I switched to an out of town job, longer hours, and just quit riding. That job is done now, we just paid off our house, and we are ready to start a new chapter in our lives. We are putting our house up for sale and moving back to Illinois, closer to family. In the interim we want to take a bike tour. I've never toured, or ridden long-distance at all. My wife is fit, but has never been a cyclist. She had a bike for a while as an adult, but never rode much, not since she was a kid. She does not own a bike now. My 8 year old son rides his single speed BMX bike constantly, everywhere, and anytime he can. I pulled him everywhere in a Nashbar trailer when he was younger. I never liked that trailer, it was uncomfortable for him. I decided this time to get a Burley Solo for the 3 year old. With the better seating, and suspension, I think she'll be more comfortable. So that's what I've got. My Jamis steel road bike pulling a Burley Solo. We need a bike for my wife, and a new bike for our son. My wife does not want a drop bar bike, she wants an upright, step through. She likes the look of the Raleigh Alysa. My budget is only about $500 for her bike, and my son's. Used is fine, I've always done my own bike maintenance. I saw a Novara Portal on ebay that is listed as a 24" wheel bike, it's got rear rack mounts. All the other 24" bikes I see do not have rack mounts. Also most of them have cheap suspension forks, and I'd rather him have a solid fork for this adventure. We have not decided on a route, but we are thinking southern states. We are avid campers, so we have backpacking gear, tents, bags, cookware, etc. I guess I'm just looking for some general input on our plans. Any advice you all can give would be tremendously appreciated! Thanks so much! I host more than I use Warmshowers as a guest. With very few exceptions, I've practically accepted everyone who has asked. However, when I do tour, I never use it as a means to save money, I look at it as a way to meet other cyclists. I'm pickier when it comes to finding hosts, if I don't find anyone interesting to stay with in a particular area, I don't bother asking and look for paid accommodations which I budget for anyway. Hi, we did the section of the Erie Canal from Lockport to Rochester, during the last week of July. So just a small piece of what you'll do, and not sure that our experience fits with the rest of the canal. Yes, you can camp at locks, but the availability of water and bathrooms was problematic for us on the stretch we did. In several towns, there were nice bathrooms and facilities, but they were locked up and you had to call a number to have someone come down to unlock it. We ended up using the fire station bathroom! So be prepared to make some calls if things are locked up. It was also difficult to get food, because the canal path travels through industrial parts of towns, not residential and grocery store type places. So getting fueled up and watered up often required detouring through towns relying on Google. We met some kind folks who let us camp in their backyard in Gasport, and when we couldn't find camping before Rochester we got a hotel in Rochester. As you get into Rochester, the trail is paved. that is when the tree root bumps start. Some nice person(s) spray-paint the bumps which does help, but sometimes there are so many you can't avoid them. But you are riding through dense, green, draping vegetation for miles. Very beautiful. The history of the canal was incredible though. General Discussion / Re: 2019 Tours - Where and when? The 102 day Side2Side transcontinental US bike ride I will do this summer is just over 5,000 miles/8,000 kilometers long. I will ride an average of just over 56 miles/90 km each day I am on the road, six days out of seven each week. The ride is unsupported and I will be camping 75-80% of the overnights. I'm 66 years old- will turn 67 during the ride- and, at 275 pounds/125 kg, am a Clydesdale rider. My bike, a 2016 Surly Disc Trucker with a Rohloff hub, will weigh in fully loaded at just about 90 pounds/41 kg. I bought a Surly Ogre a few years ago which came with Jones loop bars as standard. From the very first ride, I've loved them and now have them fitted on both tourer and MTBs. Comfort and control are excellent. I bought a pair for my son as a Christmas present and he now swears by them as well. He's wrapped bar tape around the inner and outer loops for more comfort. I find that placing my hands on the forward loop gives a surprisingly aero position, useful when riding into a headwind and, of course, you have a lot of additional space for bar mounted kit. If you want to make use of the bars for carrying capacity, have a look at the link, Beerbabe will make a bag to order and you can specify the depth.